Around AD 150 a man called Ptolemy sat in Alexandria. This was probably not unusual for the time. Perhaps, in need of a break, he watched the fishermen coming to harbour beside the long lost pharos lighthouse. Ptolemy was using the remaining scrolls of Alexandria’s ancient library to gather together all the knowledge of the world’s geography into one document. He called the result, simply, the Geography. He was forced to use only the remnants of the library since its main stock of papyrus had been lost to fire in 48 BC. Opened about 300 BC, the library aimed to hold a copy of every ‘book’ written. The accidental fire that destroyed much of it was perhaps started by none other than Julius Caesar. 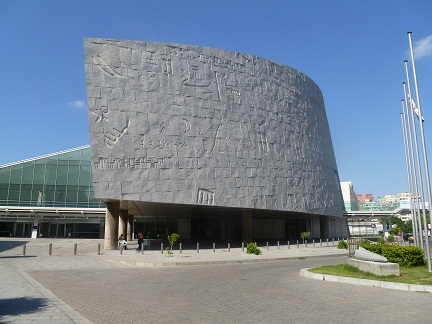 The idea of the library has remained in the world’s consciousness for such a time that a new library, the Bibliotecha Alexandrina, was inaugurated in 2002, close to the original site of the Alexandrian library. Only time will tell if it is as successful. Ptolemy certainly was. He describes his task more succinctly than I ever could, as to ‘show the known world as a single and continuous entity, its nature and how it is situated’. He was creating a map of the world (as it was then known), the eight ‘books’ listing over 8,000 locations. Strangely, from our modern viewpoint, there is no reference of the Geography’s written description containing any actual maps. It was left to the Byzantine monk Maximus Planudes in the thirteenth century to try and draw the Geography. His effort is now housed in the Vatican library. Europe looks impressively accurate, though perhaps the byzantine cartoonist used knowledge gained over the intervening millennium. Europe’s edges; the Greek islands, Crimea and British Isles; all look roughly the right shape and in their correct geographical locations. Further east than the Middle East the locations marked peter out into near-blank papyrus. Africa, though acknowledged as large, doesn’t do much more than stretch along the bottom quarter of the papyrus to where we now know Australia lies. 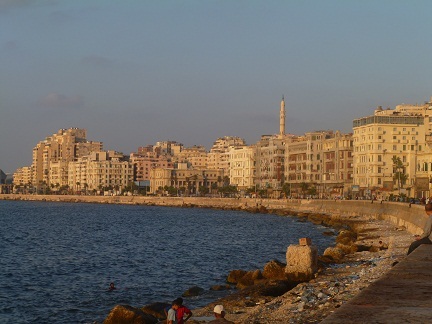 The Nile runs from sources around a confused combination of Red Sea and Indian Ocean. In this same mass of water an island that could be Sri Lanka lurks unconvincingly. While maps have evolved over the two millennia since so that Sri Lanka lies more convincingly, we owe a lot to Ptolemy’s ancient attempt. For more photographs on Alexandria’s different ages of occupation visit the Encircle Africa facebook page.